Privacy fencing is, naturally, a great way to get some privacy in your yard. Privacy fencing comes in countless styles and colors, and in different materials as well, including wood and vinyl/PVC fencing. Many home owners in Franklin opt to get privacy fencing for great reasons, not only do they look great, but it increases your curb appeal and gives you a little extra privacy! Privacy fences today come in a variety of colors and materials, and can be custom built for your property and landscaping needs. Franklin TN Fence is the leading fence contractor for privacy fence installation in the Franklin area. We have many years of experience in designing and installing privacy fencing for many residents in the Franklin area. 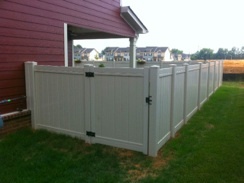 You can depend on our talented Franklin fence professionals to install your privacy fence just as your envisioned it. We strive for total customer satisfaction with each and every fence install that we do. Our team will design and install the perfect privacy fence just for you! Whether you want privacy fencing for property line marking, for safety, or for curb appeal, our fence professionals will help you choose the best privacy option for you. Call today for a free quote on your Privacy Fence project. Click here to view our Privacy Fence gallery.